MemeStreams is a reputation system for weblogs. A reputation system is a dynamic community building tool that allows members to assess the reliability of other members of the community. Ebay offers a simple example. Buyers on Ebay can rate the reliability of sellers, and vice versa. Whether the seller's product met expectations, whether the buyer made good on their agreement to pay, etc... If a large number of people all agree that a particular buyer or seller is responsible, then new buyers and sellers can feel confident about doing business with that person. Ebay's reputation system works reasonably well for the purpose of online auctions. However, it suffers from a couple of weaknesses if applied directly to the problem of assessing sources of information. The first is that it is easy to manipulate. You can create 100 fake accounts on Ebay, engage in some phony transactions, and build a history for yourself which really carries no weight. While Ebay does work to discourage this sort of activity, a slight change to their system eliminates this problem all together. Furthermore, especially with respect to information, different people have different perspectives on what reliable means. People with different political viewpoints and different interests are going to prefer different information sources. A global view of highly rated authors is only going to direct you to popular, common denominator information. We all want more personalization than this, because we all have our own unique perspectives. The MemeStreams reputation system is personal. It starts by asking who you think is reliable. Then it asks who those people think are reliable, and so on. There is no global concept of reputation. Everything starts with you and the people you trust. This eliminates the problem of phony transactions. If I create a group of 100 phony accounts and try to build a transaction history this will have no effect on the output of your reputation data unless you begin to trust the opinions of one of my phony accounts. This also eliminates the perspective problem. Each person who uses MemeStreams has their own view of who's input is valuable and interesting. We all don't have to conform to a global perspective. The MemeStreams reputation system, at a raw technical level, stores information about clickthroughs and recommendations. When you clickthrough an article on the site, the site notes who you got that article from, and who they got the article from. If you subsequently recommend that article, this information is noted again. This allows us to construct a table with quantitative information about who's articles you most often agree with. When you look at this graph you can see that there are a few people at the center of the social network on MemeStreams, and many people around the edges. 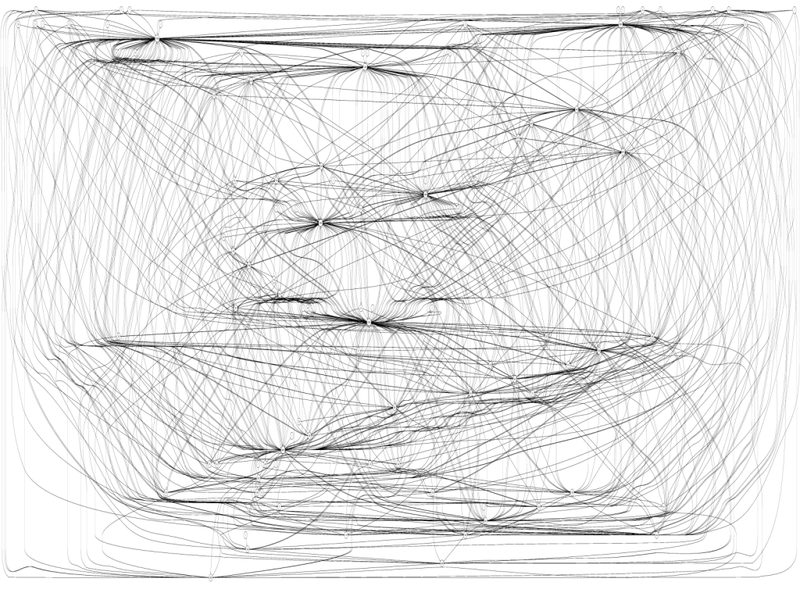 A few of the nodes link to and are linked by almost every other node in the graph. The other nodes are more sparsely interconnected. The graph below shows the number people (on the Y axis) who have a given number of inbound links in the reputation system (on the X axis). Again, an inbound link means that someone has recommended an article from that person. You might notice that some people have more inbound links then there are people in the reputation system. This is because the reputation system is broken up by topics, so it is possible for a person to have many links to another person in the reputation system. One link per topic. This sort of distribution of connections is know as a power-law distribution. Albert Laszlo Barabasi discusses this sort of network (called a scale free network) in his book Linked, The New Science of Networks. Barabasi claims that "most complex networks in nature have a power-law degree distribution. 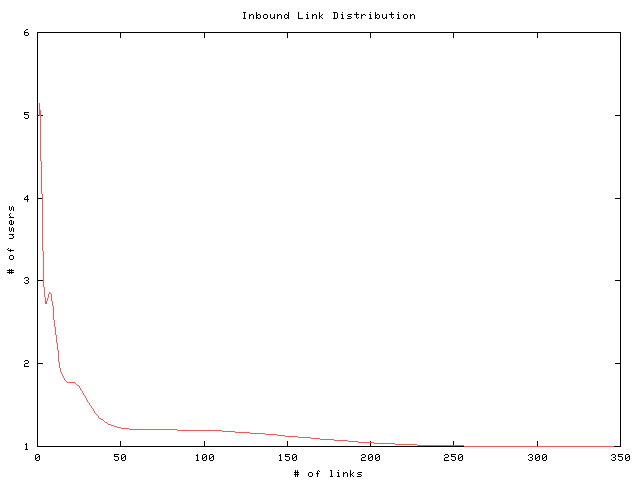 Links in the World Wide Web follow a power law distribution. So do the links in the U.S. Air Traffic Hub systems." Barabasi continues: "Neither the hierarchy of omnipresent hubs nor the accompanying power-laws were accounted for in either of the network theories available at the time that we discovered them in 1999... We would come to see that they determine the structural stability, dynamic behavior, robustness, and error and attack tolerance of real networks. They stand as proof of the highly important organizing principles that govern network evolution. There is an interactive version of this graph here. You can view the interconnections between people on the site, see each person's audience (the people who recommend their links) and sources (the people from whom they get their links), and view the specific articles that were recommended by a particular audience member or from a particular source. I would like to thank Nick Levay (Rattle) for putting these graphs together from the MemeStreams data.